I promised you lots of ice cream this summer, and I’m determined to keep my promise! Which means I have the difficult task of churning up and taste-testing limitless flavors of homemade ice cream for you. It’s a tough job, but someone’s got to do it, right? I kicked off the 2013 ice cream season with Malted Vanilla Ice Cream with Peanut Brittle & Milk Chocolate Chunks, then followed it up with a couple more flavors, and then I realized… we need more chocolate! I’m a firm believer that you can never go wrong with the combination of nuts and chocolate, and have long wanted to play around with a toasted almond fudge recipe. As it turns out, toasted almond fudge is an utterly fantastic ice cream. It’s the perfect ice cream to share, but you may just want to keep it all to yourself. 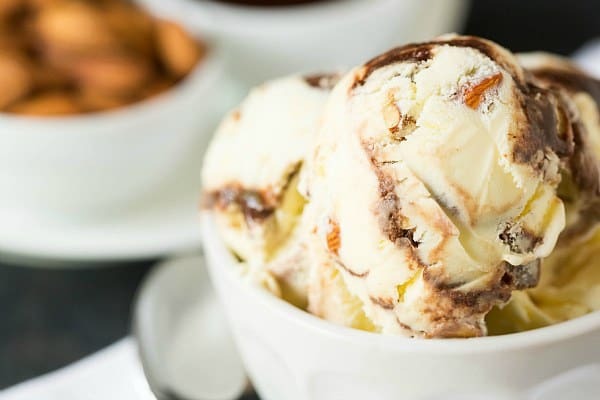 This base of this ice cream is a simple sweet cream recipe with a hint of vanilla, which is accented by chopped toasted almonds and a velvety-smooth fudge swirl. 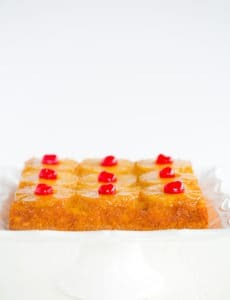 You could choose to add ¼ teaspoon of almond extract to the custard base if you want an additional punch of almond flavor. I’m not a huge fan of almond extract unless it gets baked off in some manner, but if you like it, go for it here. 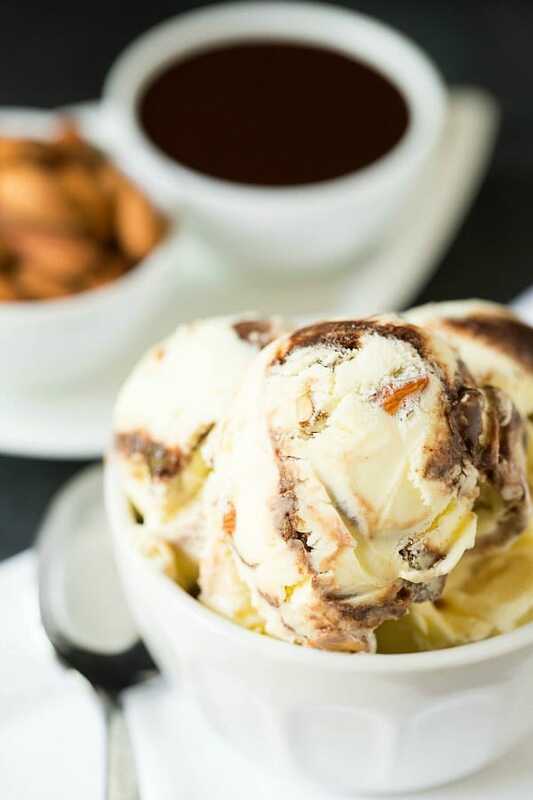 I love the contrasting toasty crunch of the almonds and silky smooth sweetness of the ice cream and fudge ripple. I foresee a summer full of ice cream love on the horizon. What have you churned up so far this year? 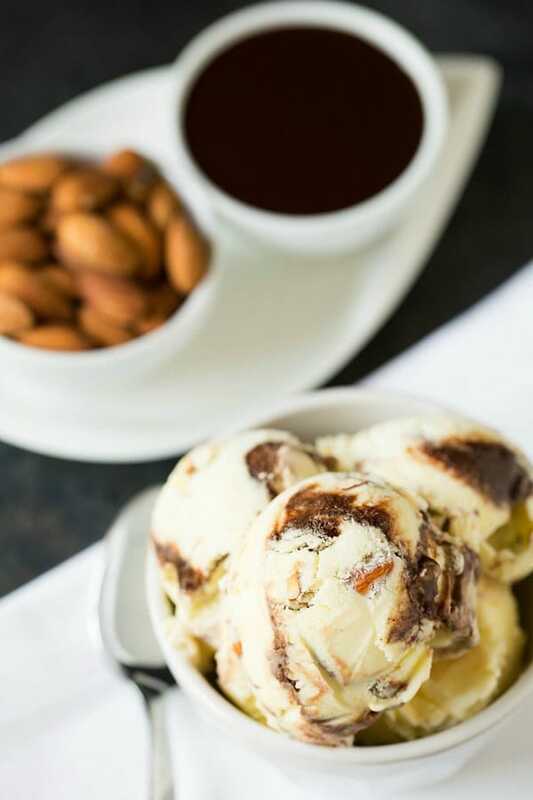 Toasted almond ice cream with a delicious fudge ripple. Make the Ice Cream Custard: In a medium bowl, whisk the egg yolks to break them up. Add ¼ cup of the sugar and whisk to combine; set aside. In a medium saucepan, stir together the cream, milk, remaining sugar and salt and place over medium-high heat. When the mixture approaches a bare simmer, reduce the heat to medium. Ladle out a scoop of the hot cream mixture and, whisking the eggs constantly, add the cream to the bowl with the egg yolks. Repeat, adding another ladle-ful of the cream mixture to the bowl with the egg yolks, continuing to whisk. Pour the egg yolk mixture back into the saucepan. Using a rubber spatula, stir the mixture constantly over medium heat until it is thickened and coats the back of the spatula (it should register between 170 and 175 degrees F on an instant-read thermometer), about 1 to 2 minutes. Strain the custard through a fine-mesh sieve into a clean bowl and whisk in the vanilla extract. Place the bowl in an ice bath and stir the mixture occasionally until cool. Remove the container from the ice bath, cover and refrigerate until completely chilled, at least 2 hours or overnight. Churn the Ice Cream: Freeze the ice cream according to the ice cream maker's instructions, adding the chopped almonds during the last minute of churning. As you transfer the ice cream to the storage container, alternate layers of the ice cream with drizzles of the fudge ripple. Once all of the ice cream is in the container, use a butter knife to gently swirl the mixture. If you cannot find (or don't want to use) corn syrup in the fudge ripple, I would recommend substituting Lyle's Golden Syrup. OMG! I made this ice cream and doubled the recipe, thank you Michelle worked like a dream! I must say this is one of the best tasting ice creams I have had in a while, and I can be an ice cream snob ;) This ice cream is creamy and tasty with those oh so good toasted almonds and rich swirls of bittersweet chocolate. Definitely give this ice cream a try you won’t be disappointed. Did I say this was very very yummy! Do you think this recipe can be doubled, I have a four quart ice cream maker and would love to make a larger quantity, ice cream goes pretty fast around here. Hi Victoria, I don’t see any reason why not. Enjoy! this recipe needs an ice-cream maker to make it? or it will success if i follow your instructions? You make the best looking ice creams, Michelle! I need to get my ice cream maker going again soon. A velvety-smooth fudge swirl? SWOON! Oh my gosh vanilla almond ice cream is one of my favorites, and now with a fudge ripple? Yay! 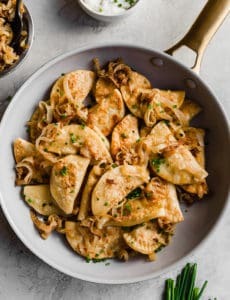 FYI – I Pin about 95% of your recipes. Keep ’em coming! I am determined to make lots of ice cream this summer as well – love this one. The fudge and the almonds sound wonderful! I have not stopped dreaming about the malted vanilla flavor you posted since the post first came out. I just have to get around to buying the malt powder! 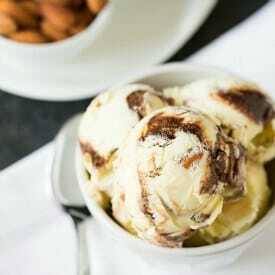 I recently made Jeni’s Sweet Basil with Pine Nut Praline Ice Cream. Unusual yet yummy. I love the contrast in texture between the crunchy almonds and velvety chocolate fudge swirls. This sounds like a winner combo Michelle! Oh my, I’m adding this to the top of my TBM (to be made) list. I just got an ice cream maker about a month ago, and am having great fun. So far I’ve whipped up the basic chocolate, and the basic vanilla ice cream (no eggs). Currently I’m slogging through eating (ha!) some lemon gelato (six yolks, heavy cream, whole milk, sugar, SIX lemons). Oh my goodness gracious. Homemade ice cream is such a blast! Michele, I am with you. I’m in an ice cream making frenzy this year. I just stocked up on light cream, heavy cream, and sweetend condensed milk. I’m playing the mad scientist these days. The first experiment to roll out of my kitchen is a Frozen Vanilla Peach Yogurt. I have never made a custard based ice cream so your recipe would be a good one to attempt. I love a ripple in ice cream. My ice cream maker doesn’t seem to do a very good job freezing a batch. Is it just mine, or are they all like that? Hi Eileen, When you churn fresh ice cream, the finished consistency is that of soft-serve ice cream. It needs to sit in the freezer for at least 4 hours or so to get to the truly frozen consistency of traditional ice cream. It just so happens that I have everything needed for this on hand. :) I have a small ice cream maker that I got several years ago for Christmas and never used. This sounds perfect for it. 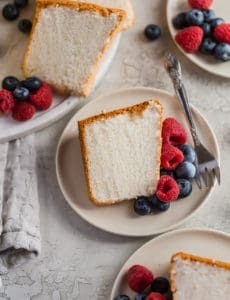 I think I’ll make this for Father’s Day dessert! Love this! Love fudge ripple because it reminds me of those little dixie cups we used to buy from the corner store…and toasted almonds is one of my favorite things. This is a delicious combination! This sounds delicious!! Love the fudge ripple! It looks so delicious and I just got an Ice Cream Machine. I think this will be happenning very soon in my kitchen! Thanks for this recipe! Fudge ripple is so good! Ice cream is the best and homemade ice cream is even better! Looks soooooo good! I love the fudge ripple. Your ice cream recipes make me understand why I NEED an ice cream maker. I love the ripple, great flavor combo! Nom Nom Nom!! Love me some ice cream!!! WOW! This looks amazing! I have to make this! Wow that looks so good! I posted an ice cream recipe yesterday and linked up your post with all those ice cream flavors you posted Monday! I still can’t believe you have so many! And this one looks wonderful. Anything with ‘ripple’ woven in, I am going to be a fan! So excited you are “churning” out some new recipes for us!! Can’t wait to try this one! You’ve got another ice cream winner in my book. That swirl just looks sinful!